When to go on your trip? This is an important part of planning. Let us give you some things to think about. Assuming you've chosen your destination... now you need to decide when to go. When will you have the best weather? Is there a best season to travel? ...the wildebeest migration in Africa? If you have something specific in mind you need to take several factors into account when you're figuring out when to go. We're not going to give you hard, fast suggestions; we just want to remind you what you should be thinking about so your dream trip WILL be a dream trip and not turn into a nightmare. It won't just be when the kids are out of school or when it's summer where you live. Think about what will be the best time to go for where you're going and what you want to see. What is the best season; when will you have the best weather for what you want to do. Is it wet or dry season? This counts a lot in some areas where your concept of winter and summer don't count as much as whether the roads are passable or not. Are the days long or short? I once had someone tell me they thought they were all the same length! I'm talking daylight here, right?! And northern or southern hemisphere. Is it warm or cold? Pleasant for hiking or perfectly cold for skiing? Are there holidays Do you want to avoid them because of local crowds (and tourists) or are there festivals that are must sees for you? Like Mardi Gras or the Running of the Bulls in Pamplona. We stopped in Pamplona for lunch on a driving trip through Spain. We lunched right on the street... without the bulls or the crowds. That was good enough for us. Are the tulips in bloom? Are there gardens you want to see? Fall foliage? We drove through the tulip fields of the Netherlands once... out of season they weren't so colorful. If it's off season, what is open and what is closed? Is it Opera season? Baseball season? Is there an airshow to see? Are the animals migrating..? And if so, where are they..? In Africa, should you be in the Serengeti or Masai Mara? ....Or, and you don't want this, are they hibernating? 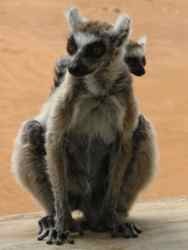 Are there lots of baby animals to see? Are turtles coming ashore to lay eggs? Are birds in their "full breeding plumage"? When is it easiest to spot animals? Is it easier to see animals around water holes when other sources are drying up? So then, is it too hot then or is it worth it? Is it harvest time in wine country? ...And is that wine country in the Northern or Southern hemisphere? I could go on and on. I just wanted to get you thinking about when to go on your trip. We went to Madagascar at the end of the dry season. It was the best time to see baby lemurs, there were really no leeches to worry about in the rain forests (and have I mentioned I hate leeches? ), and the trails were mostly dry and safe to hike... And the roads..... well, as bad as they are at least they were passable. We did have to set it up further in advance than we usually do to make sure of getting the accommodations we wanted and the internal flight reservations, but in this case, going during high tourist season was worth it. There are fewer crowds, we can just drive up or fly in and find accommodations, and we can really ramble at our own pace and just plan our days as we go. You may run into a little more rain in shoulder seasons, and some tourist attractions may have shorter hours, but you'll probably save money. So when you're thinking about when to go, we do advise at least thinking about shoulder seasons. We went to India to see tigers at the very end of the hot dry season.... uncomfortably hot if you want to know. We chose to do this because we had been looking for tigers on three other trips, and we had not seen them. At the end of the dry season, grasses were low and water was concentrated in only a few water holes. 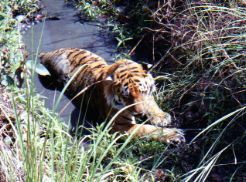 The tigers went looking for those water holes, and they were easier to see when they couldn't hide in tall grasses. We saw tigers every day! We were so excited that putting up with the heat was worth it. Sometimes you need to think about this too. We had friends who went diving in Honduras in the off season. To quote their e-mail: "It's been raining since we arrived, in fact, we didn't know it could rain this hard for this long. We skipped the morning dive trip because of this heavy rain..... There are only 2 couples at the resort, probably because everyone else in the world knows that this is the rainy season here!" Take this as a lesson. The off season can be OK for some places and some activities, but just do enough research so you know what you're getting into! Here's an interesting website to check for helping you decide when to go: Best Time To Go.com Put in the continent and city you want information on and they'll tell you rainfall and temperature, approximately how much it will cost you per day, when the holidays are, and it even gives you some hotels and helps you connect to local help. Browse through our website for travel ideas, or watch TV travels shows, read magazines or books, or just follow your passion.